A late, eighteenth century, ivory scale rule by Dollond of London, which would originally have been part of a pocket set of drawing instruments. There are diagonal scales on the reverse. 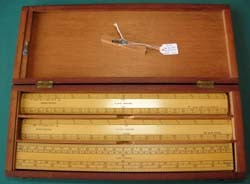 An early, nineteenth century, ivory, twelve inch scale rule by Cary. Unusually, the zero is not at the end of the scale, a feature of early rules. 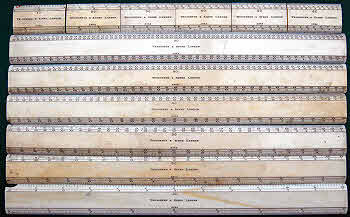 Two nineteenth century plotting scales, the upper in ivory, showing the upper face, and the lower, in boxwood, showing the diagonal scales on the reverse. These are both quality scales, this being indicated by the number of scales on the upper face and the fineness of the diagonal scales on the reverse. An eight inch, unsigned, triangular scale, and a twelve inch Stanley triangular scale. Both are boxwood and date from the early twentieth century. 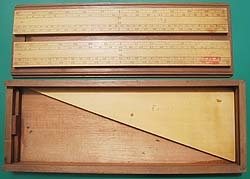 AJS No 7 twelve inch boxwood triangular scale rule. Probably made by A.J.Smith. A set of four boxwood scale rules and marquois scales by Cary. The marquois triangle is missing, but has since been replaced. A set of six boxwood scales by Stanley, edged with white celluloid or ivorine, again housed in a mahogany case, and dating from the 1920s or 1930s probably. A set of twelve inch, boxwood scales retailed by the Army & Navy Stores. 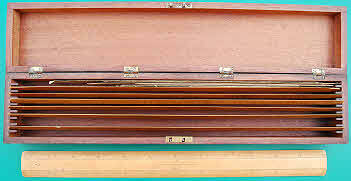 The mahogany box also contains a set of six, two inch offsets. This set dates from the early twentieth century. 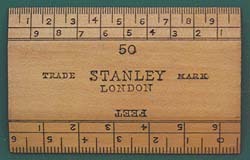 Stanley six inch ivory scale rule from circa 1900. Two further sets of card scales. The upper one is a set of nine surveyor's scales by Eyre & Spottiswoode, no. 157-2V. The lower is a Reeves set of eight engineer's scales. Although these have Reeves' name on both case and scales they are identical to a draughtsman's set printed by Eyre & Spottiswoode and sold by Miller's Drawing Materials Ltd of Glasgow. This photograph shows two sets of Low's Improved Drawing Scales, one a set of three and the other a set of four. These were intended for use in engineering drawing. They were published by Longmans Green and were, unusually, of nine inch length. Three engineer's steel rules. A twelve inch, spring steel, double sided one by Rabone & Sons of Birmingham, no.64A; a six inch no.417D double sided pocket rule by Chesterman, Sheffield; and a nine inch, three fold, no. 1205 pocket rule, also by Chesterman. More steel rules are on the Workshop Measuring Tools page. A triangular plastic rule by Staedtler Mars, no. 56198-2, dating from the 1960s or 1970s. It has a transparent plastic case. A W Faber-Castell six inch Armstrong scale made in Bavaria. Retailed by B T Cheshire & Sons Ltd, Stationers & Printers, 22 Queen Street, Wolverhampton, whose label is on the card case. The rule is made of wood in three sections, joined longitudinally with inset brass strips at each end and celluloid facings pinned through the brass strips at the ends. Blundell Harling “Verulam” metric architect’s six inch double sided scale No 3V to BS1347, RIBA approved. It has a blue/clear vinyl slip case. I have a large collection of scales and rules and it is only possible to show a few of them here. They range from eighteenth and nineteenth century ivory ones, through flat and triangular boxwood ones, with and without celluloid facings, to modern plastic ones. I also have ivory and boxwood folding rules, and steel rules. There are also a number of promotional rules, many from the building trade, not included here. 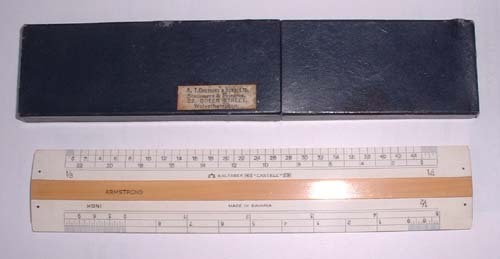 Promotional scale rule for Burn Brothers (London) Ltd made by Abbot Brown, Beaminster, Dorset, England. It appears to be made of celluloid laminated to a core of wood or some other material. Date probably about 1950. 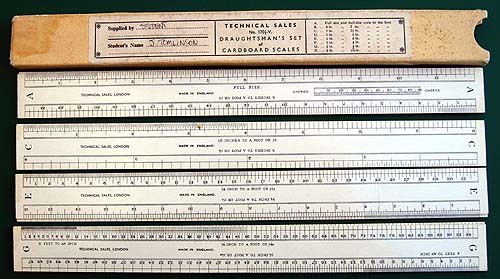 A set of eight draughtman’s scales retailed by Technical Sales, no. 170 ½V. Like the Reeves ones, these are the standard Eyre & Spottiswoode design. Engine divided ivory scale rule by J Hicks, 8, 9 & 10 Hatton Garden, London for 1/2500 Chains, dated 1904. Also marked “OS 6 04 100” showing that it was bought by the Ordnance Survey in 1904. Casella “Royal Geographical Society No 7” scale. Boxwood, approximately 11 inches LOA. An unusual scale for “Lengths of 1° “. The vertical divisions are “500...” to “20 MILLS”. Originally the property of a cartographer. I would like to know more about this scale and how it was used. Thomas Bradburn & Sons, Birmingham, builder’s universal rule, probably late 19th century. This 12 inch boxwood rule has a semi-oval profile, the bottom face being flat. It has a total of 16 scales, many of which can only be used with the aid of dividers. These rules became obsolescent with the introduction of the Armstrong scale. A set of Marquois scales and triangle. They are housed in a mahogany and pine box with a sliding lid, the form in which they were commonly sold. These scales were also included in both Woolwich and Sandhurst cases and were used for military purposes. The special triangle has a ratio of 3 between the lengths of the hypotenuse and the shortest side. T B Winter, Newcastle on Tyne, ivory 12” builder’s universal rule, late 19th century. The 16 scales are the same as on the Bradburn rule above. 6” ivory builder’s universal scale signed J Dobie, 205 Argyle St., Glasgow, ca.1900. It has 14 scales. W F Stanley two inch offset scale for 50 links (to the inch) and feet (equivalent). These were used for plotting the offsets measured at right angles to the chain when chaining (a method of surveying with a Gunter chain) and were used in conjunction with a chain scale of the same scale. They were often sold in boxed sets of six or ten chain scales and the same number of offset scales, such as the Army & Navy Cooperative Stores set shown above. Ivory four fold two foot rule with electrum fittings dating from the mid-19th century, originally the property of a surveyor. It has been repaired near the centre hinge with two riveted on brass plates. It was not unusual for broken rules to be repaired this way as they were relatively expensive items. Square section ivory and brass four fold rule, 18 inches long. These are more commonly found in the twelve inch length. Cooke, Troughton & Simms area computing scale for working out the area in acres of a piece of ground drawn either to a scale of 1/500 chains or 1/2500 chains. The plan was overlaid with a transparent sheet having lines ruled at set intervals to correspond with the scale of the plan. Starting with the lowest ruled line and with the sliding frame aligned to the zero at the left hand end, the wire in the frame was first set against the left hand edge of the piece to be measured and then, with the scale held steady, advanced to the right hand end. The scale was the lifted and placed on the next higher parallel line with the wire against the left hand edge. The frame was then advanced as before, and so on until the piece of ground had been covered. The area in acres could then be read off the appropriate scale. A nickel silver diagonal scale approximately eight inches long. The scales on this side are metres 1/1000 and 1/2000; on the other side they are metres 1/2500 and 1/5000. Continental, unsigned. Probably mid 20th century. A four fold, twelve inch ivory and electrum rule. The outer, inch scales are very worn but the inner, metric scales are still quite clear, evidence of it having been regularly carried in a pocket. in, ½, 3/8, ¼ and 1/8. Set of six ivory chain scales and six offsets by Troughton & Simms, ca. 1900. They are for 10, 20, 30, 40, 50 and 60 links per inch and equivalent feet. Two foot two fold boxwood and brass rule no 1067 by E Preston & Sons, Birmingham. The upper picture shows the ‘8 Square’ and ‘Line’ scales used for marking out an octagonal section prior to rounding timber and the lower picture shows the brass slide that extends the rule to 3 feet and can be used for depth measurement. Two foot four fold rule by I & D Smallwood, Birmingham that features a protractor hinge and a level. Boxwood and brass. Ivory scale from a small set in a fish skin case, early 19th century. The scales on the face shown on the left are dialling or navigational scales rather than the more usual plain scales used by architects and engineers seen on the scales nearer the top of this page. General no. 301 flexible, stainless steel, engineer’s pocket rule made in the USA. Second half twentieth century. Six inch, triangular, ivory scale rule signed G W Strawson, 15 Percy St, London W, dating from the 1870s. An unusual ivory scale. One face is divided for French Lines and Centimetres; the other face is divided for Inches 1/16 and Inches 1/10. Celluloid and boxwood scale rule signed C T Asquith & Co, 21 Caxton St SW1. It has scales for 10 and 40 to the inch. The construction was patented in 1926 (GB252098) by the Messrs McCarthy of Summerly Works, Earlsfield, SW18. Satin finish rustless steel scales by Chesterman, ca.1960. The upper scale in both pictures is Imperial; scales are inches 1/50ths, 1/2 decimal, 3/8 decimal and 1/4 decimal. Scale length 20”. The lower scale in both pictures is metric; scales are metre 1/100, 1/50, 1/25 and 1/80. Scale length 50cm (nominal). A set of 9 card scales, 18” long, signed Holtzapffel & Co Engine Divided and a black card case. The single sided scales are for 1/12”, 1/16”, 1/8”, 3/8”, 1/4”, 3/4”,1/2”, 1” and 3” to the foot. Probably early 20th century. The upper rule, of which both sides are shown is by Faber Castell type 2753/BA7 and is made to the requirements of BS1347/3. It is an architect’s rule. The other two rules are single sided and entitled RICS Metric Scale A and RICS Metric Scale C. RICS are the initials of the Royal Institute of Chartered Surveyors. The maker of these two rules is not known. They possibly date from the 1960s when Britain went metric. Set of four card scales; single sided, each has four scales on it. In this set the bottom two card scales are identical although they don’t appear to have had much, if any, use. The reason for this is unknown - could it be an error in packing or an unintentional swap? Ivory & nickel-silver printer’s four-fold, 12” rule signed Harrild & Sons London. Harrild & Sons were printers’ brokers and roller manufacturers so would not have been the maker. It has the following scales: on the inner faces, running the full length, BO. (Bourgeois) and MIN (Minion); on the outer faces, running the full length, LP. PE. (Long Primer and Pearl) and P. NON (Pica and Nonpareil); on the outer edge, 12” x 1/8”; on the inner edge, E. (English) and S.P. (Small Pica), half length each from each end to centre. Apart from the ordinary inch scale on the outer edge these are all scales for the old bodies (sizes) of type in use before the use of point sizes. The scales on the outer face are both double scales for pairs of ‘old body’ sizes, one twice the other. It dates from about 1860. The Colliery Manager’s Scale, Hardypick Ltd, Sheffield. Boxwood, oval section, 9” scale length. Scales are: 2 chains per inch, yards & chains; Ordnance scale 1/2500 yards & chains. 12”, double-sided, ivory, builder’s universal scale signed Riddel & Co, Belfast (probably the retailer rather than the maker). It has 16 inch scales as follows: 1 1/2, 3/4, 3/8, 3/16; 2 in, 1, 1/2, 1/4, 1/8: 2 1/2, 1 1/4, 5/8; 3 in, 1 3/4, 7/8. Probably late 19th century. 12”, double sided, ivory, architect’s universal scale. It has 16 edge and middle inch scales as follows: 1 in, 1/2; 1/4,1/8; 3/16, 5/8, 7/8, 1 1/4; 3 in, 1 1/2; 3/4, 3/8; 1 3/4, 2 in, 2 1/2, 4 in. Probably late 19th century.